We attended the Market-JFK Vision Zero Safety Project Steering Committee earlier this week. The meeting was convened by Philadelphia’s Office of Transportation and Infrastructure Systems, and included major property owners and stakeholders along the Market and JFK corridors. We learned a lot about the timeline of the project and what’s coming with respect to education and enforcement. Striping and flex post installation is substantially complete. PPA’s revision to signage and rearrangement is substantially complete. Bicycle signals have been installed at 16th and Market and 20th and JFK. 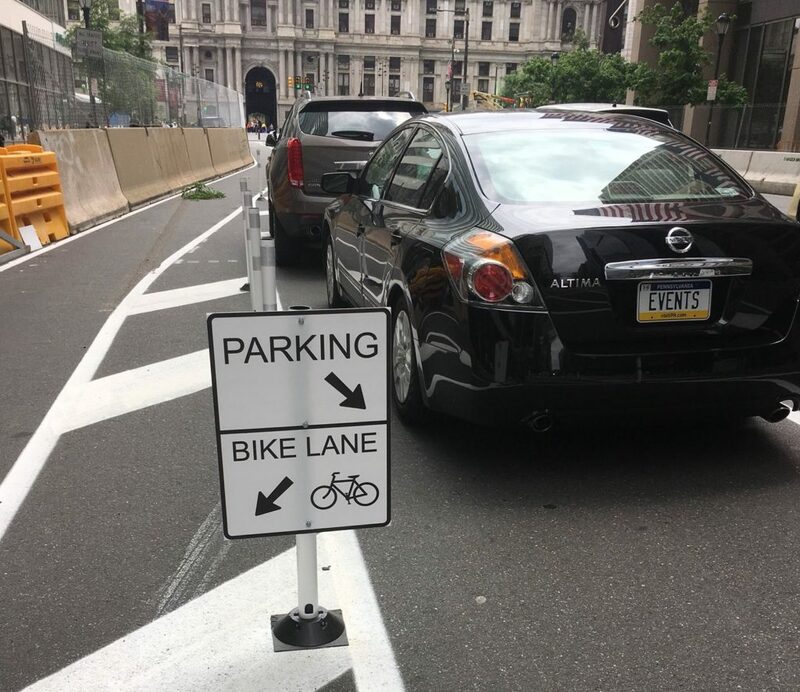 The Office of Transportation & Infrastructure Systems is partnering with the Philadelphia Police Department 9th District and Philadelphia Parking Authority on three education and enforcement initiatives as part of the pilot, as requested by the Councilperson. Starting last week, PPD 9th District began handing out palm cards to both bicyclists and motorists about riding on sidewalks and yielding to pedestrians. This focused enforcement/education period will last for two weeks. Starting 6/22, PPD will ticket those bicyclists riding on sidewalks and motorists who fail to yield to pedestrians. This effort will focus on 16th and JFK, 16th and Market, and 19th and JFK. As the parking and loading signage update is completed, the PPA will begin to enforce parking regulations this week. “Burma shave”-style signs will be placed on flex posts with several messages directed at bicyclists regarding giving peds right of way. Why do 1700-1500 blocks of Market Street look different? The Philadelphia Department of Public Property and SEPTA are doing construction work on these blocks for the duration of the pilot. Consequently, the bike lane is next to the construction zone. 1500 Market – SEPTA is installing elevators and doing waterproofing work and the north side of Market St. The City is working with SEPTA to coordinate pedestrian and bicycle access during each phase of construction. 1600 and 1700 Market – The Department of Public Property is resetting the sidewalk grates currently on the 1700 and starting on the 1600 block soon. These three blocks may be impacted by construction during the entire “pilot” project. If and when construction finishes, adjustments may have to be made to the configuration of the bike lane. How is the pilot being evaluated? The City worked with partners to collect a comprehensive set of before data points this Spring around the goals of Safety, Mobility, and Quality of Life. Key data points include vehicle and bicycle counts, vehicle travel time, median, and peak speeds, and pedestrian volumes, among other measures. Data will be collected again in July and September to measure the impacts of the project. How will the JFK bike lane be extended to 30th Street and in other directions? The City is evaluating options, which will likely correspond with the completion of PennDOT construction from 20th – Schuylkill Avenue and with Amtrak’s plans to redo traffic circulation patterns around 30th Street Station. The City is also looking at connections north on 15th Street and west on Market. Stay tuned. What if I see cars/trucks parked in the bike lanes? More information from the City’s Office of Transportation & Infrastructure Systems here. Thank you for the important update! Why is the bicycle lane not protected between 19th and 20th streets? I’ve heard a few different reasons for this. I have a request out to the city for an official response. Will update the blog when I get it. In the meantime, groups of motorists will continue to accelerate and run red lights at 15th, 16th and 17th St. (also 18th and 20th) crossing Chestnut, Market, and JFK with zero enforcement. –mcget/trophybikesPHL • • • • PS–what ad firm or entity is designing these anti-cyclist warning posters? They’re positively remedial. Call Elliot Curson or someone who knows marketing ASAP.